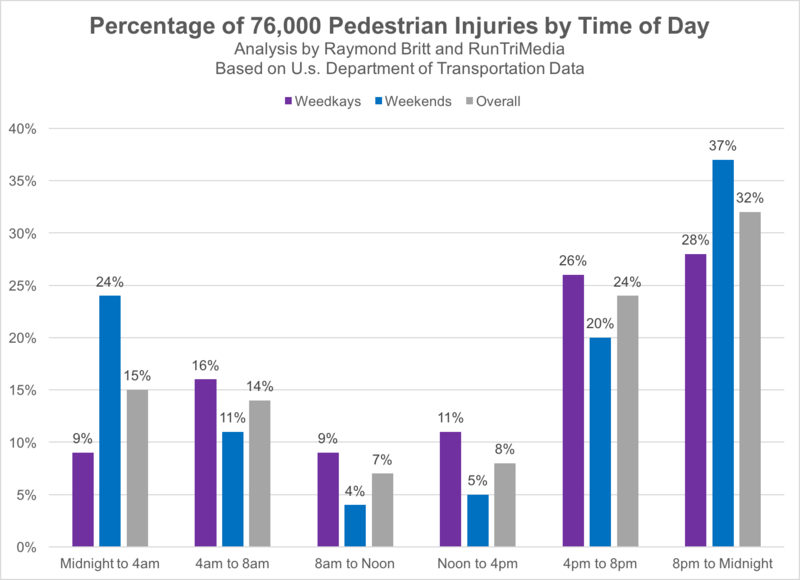 RunTri: Train Safely: How Many Runner/Pedestrian Accidents Each Year? Train Safely: How Many Runner/Pedestrian Accidents Each Year? We all train as safely as possible, whether cycling, running or walking. Unfortunately, accidents happen, a staggering number of accidents, actually. Here, we lay out the details, as collected by Department of Transportation and related government agencies. 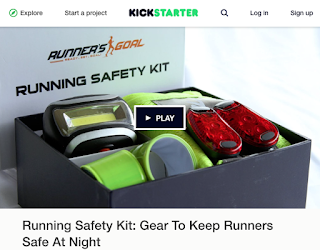 As you take in the numbers, we suggest you consider your personal safety with reflective gear like this Running Safety Kit, a new product in development, currently raising funds on Kickstarter. In 2012, Department of Transportation stats reported 67,000 'Pedestrian' (Walk, Run, Stationary) accidents requiring a trip to the hospital, While data specific to runner accidents were not reported, we can get a better sense of the proportion of runners, based on type of accident and time of day. We'll make an unofficial estimate of 35,000 runners with injuries requiring a hospital trip. 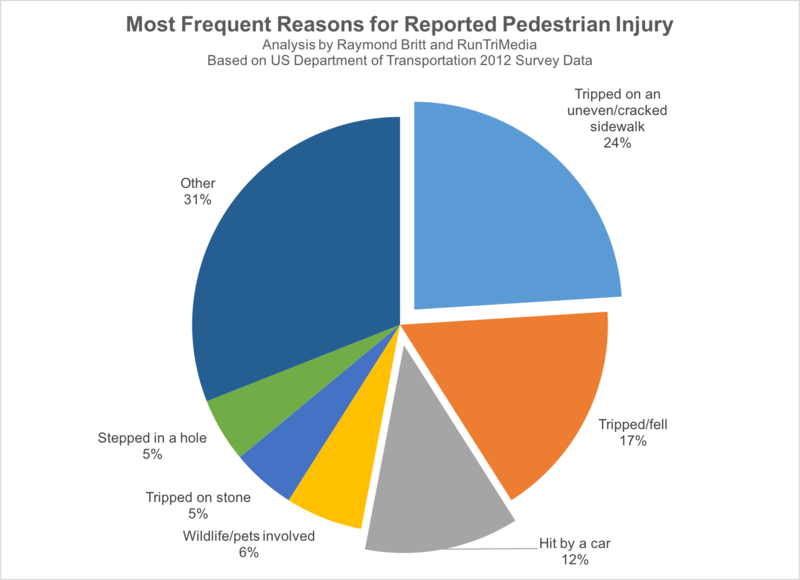 Of the most frequent reasons for reported injuries, runners are likely to have higher representation in the 'tripped on uneven/cracked sidewalk' (24%) and 'hit by car' (12%) categories. Yes, there are other 'tripped' categories, but I'd venture more walkers than runners fit that category. Time of Day is paints an even clearer picture of the degree to which runners are seriously injured. Out of the 67,000 injuries to Pedestrians (remember, walkers, runners, stationary), the injury time of day shows peak times are after dark, when I'd argue a far more number of runners are training than walkers taking a stroll. How to Improve Safety on the Run at Night? Most runners are aware that reflective gear should be worn after dark. But, honestly, most don't take that added safety precaution. All Reported Accidents = 321,000 = 158,000 men and 163,000 women. Note that these numbers are most certainly understated; many more accidents are not formally reported. 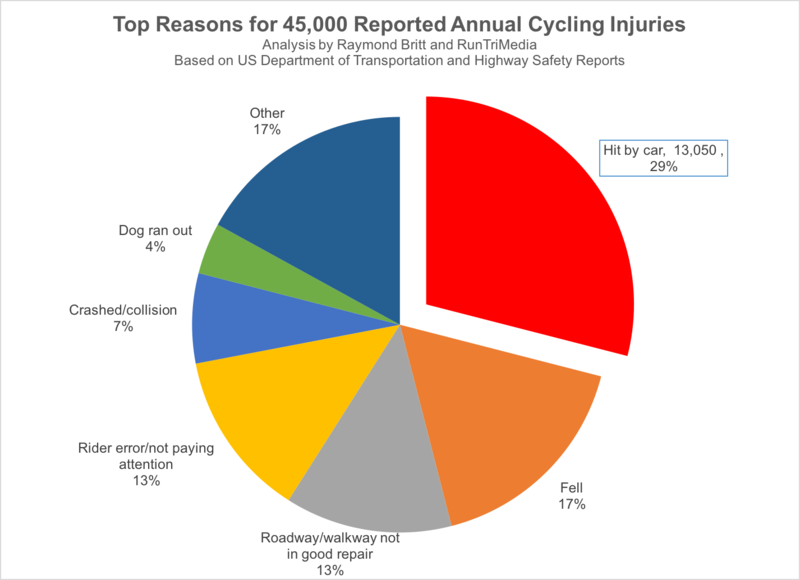 Serious cycling accidents requiring a trip to the hospital = 45,000 = 36,000 men and 9,000 women. It's remarkable to see the rate of men involved in serious accidents, at 22%, far exceed the 6% rate for women. See the following pie chart, distributing causes of cycling injuries. 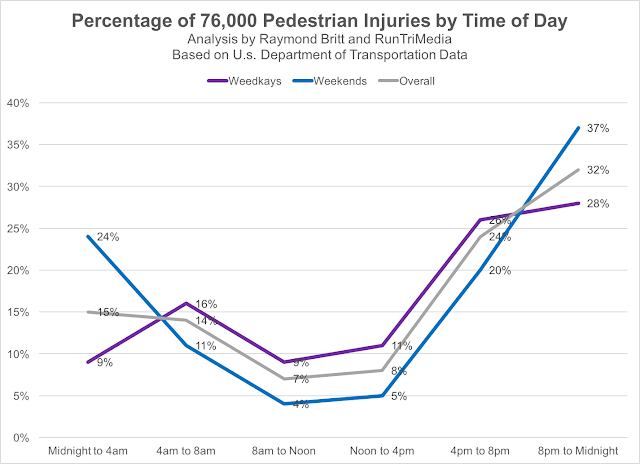 Notably, 29% or 13,500, are hit by cars. But a majority of the injuries, according to this data, appear to result from some form of rider error. Many of these can be prevented.